Before you know it, the pool weather will be here and your kids will be looking for a fun place to cool off. Headed to a water park? Who wants to buy 2 tickets for the same park for 2 different experiences. Some parks make you buy one ticket for the water park and one for the amusement park? Kings Dominion only charges one park price for both their amusement park and their water park. One great price, 2 great experiences. The 40th Celebration continues at Kings Dominion as WaterWorks transforms into Soak City. 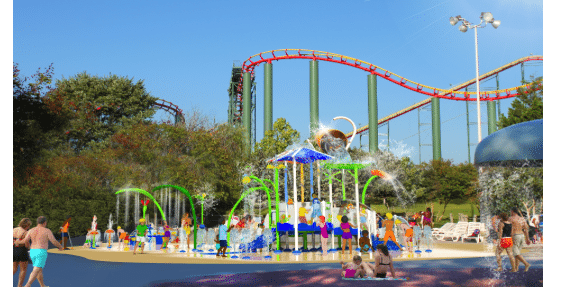 An expansion and renovation of Kings Dominion’s all-inclusive water park is well underway. It will be opened soon and you can experience this amazing expansion for yourself. However, you won’t be seeing me up on top of that ride, but down below taking photos of my kids having a blast. Make sure you are prepared when visiting Kings Dominion and read our post about what to pack. A 65-foot tall slide tower that features three thrilling attractions, each one providing a unique riding experience. Paradise Plunge sends thrill-seekers into an almost vertical free fall as the floor drops out from underneath their feet. On Aqua Blast, riders are sent twisting and spiraling through an enclosed chute featuring 360-degree turns. Thunder Falls launches riders in a tube down a series of intense drops and turns. Splash Island, a new children’s area that will double the size of the current children’s options in the water park. The family-friendly splash zone will create a magical play environment for children of all ages and abilities. Features include small slides for young children and multiple jets of streaming water that spray up from the ground, as well as overhead. Splash Island allows family members to play, socialize and enjoy the water park experience together. Improved Guest Amenities: Upgraded family changing areas, an additional restroom complex, expanded deluxe cabanas featuring WiFi and television, and new restaurant concepts designed by Kings Dominion’s Executive Chef. The Soak City makeover will include an updated entrance area and landscaping throughout the 20-acre water park. Guests who want to be among the first to experience these exciting additions at the park can purchase 2015 Kings Dominion Season Passes now. Passholders enjoy many benefits, including: Bring-A-Friend discounts, food and merchandise discounts, and early access to select rides and the water park. Soak City is included with general park admission. To learn more and plan your visit, be sure to visit : www.kingsdominion.com as well as our post on Spring Fever Events. Not sure if the park is suitable for your kids ages/ heights I thought I would add the Rider Height Guide for Soak City. Be sure to check out our Post on what to pack when visiting a Water Park and Kings Dominion. What sort of rides do you like to ride when you visit a Water Park? Oh my gosh!! this place looks so fun!! My kids AND husband would love those slides! Soak City sounds so much fun! I need to head this way to try this out! Looks like such a fun place. This would be a great place to take my grandkids if we get up that way. Waterparks are so much fun! I haven’t been to one in the US but I did visit one called Kenji World in Morioka, Japan and it was tons of fun. I like the long slides! Water parks always look like so much fun. We just have one indoor one up here in Alaska, but I remember seeing tons when we lived in the midwest. Water slides are my favorite. We used to go to Kings Dominion every year. Wow that place looks awesome. My kids would love it. wow! My kids would be in heaven here! They love water parks! I have not heard of this water park before. It looks right up my kids alley! It’s been years since I’ve thought about kIngs dominion. When I lived in NYC it was a summer destination. Ah, I love this! We have season passes to our local Six Flags and the waterpark is really important this time of year. I love to do the lazy river and the wave pool. I can’t lie. The big slides scare me. Who doesn’t love water parks? This one sounds like a lot of fun. We did check this place out! I haven’t experienced any of the water rides though! This looks like such a fun place! I haven’t been to a water park in YEARS. I know my kids would love to go to one. I have never heard of this park before, but it looks like a lot of fun! Water parks are so much fun. We try to get to one at least once each summer. I have never been to a water park before. I would like to ride the Paradise Plunge. it’s sounds really fun.